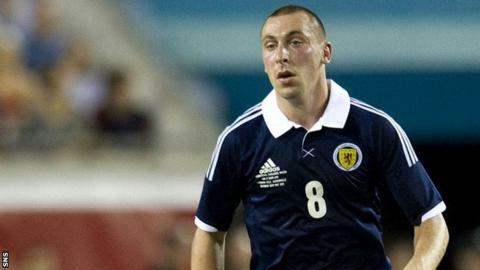 Scotland international Scott Brown sees no reason why he can't play in both upcoming World Cup qualifying matches. The Celtic captain has been plagued by a hip injury which has limited his appearances this season. And Brown is focusing on being fit to face Wales on Friday before thinking about Tuesday's match with Belgium. However, asked if he could feature in both Group A qualifiers if called upon, the midfielder said: "I don't see why not. I feel okay." If he's confident he could maybe manage both games, then who are we to argue? Brown's club manager Neil Lennon has already given Brown and Scotland manager Craig Levein the green light for Brown to play both matches if possible. "He says it is up to me," said Brown. "If I feel fine to play one game, play one, and if I feel okay for two, just go ahead and do it, whatever my body can handle just now. "I'm going to try for Friday first of all and see how I am. I'll take everything one step at a time and Wales is the most important game now. "After the game on Friday, if I play, I'll take it step by step. We will just have to wait and see. "I missed out on the Hearts game at the weekend but I'm feeling not too bad just now. I'll see how training goes in the next few days." The positivity of Brown over his fitness was welcomed by Scotland assistant manager Peter Houston. "He knows his body better than anyone," said the Dundee United manager. "We'll have to monitor the situation if he's picked for the Friday night game and see how his recovery sessions are. "He has had problems there's no doubt, but, in the same breath, if he's confident he could maybe manage both games, then who are we to argue?" Houston, however, stressed that they would not take chances with Brown. "If we don't think he's right for the second game, if he plays the first one, we'll monitor that and take advice from the physios and doctors, and most importantly from Scott himself." Houston, though, played down suggestions that Scotland were favourites after Wales slumped to two defeats in their opening fixtures. "Sometime, a wounded animal is a dangerous animal," he added.